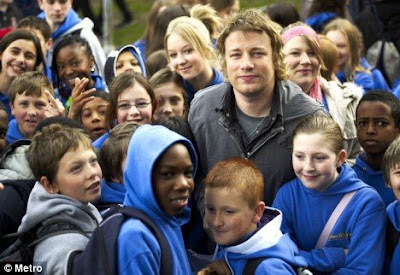 Weighty Matters: Jamie Oliver's at it again! You've heard of Jamie Oliver, right? He's the British chef who single handedly changed his nation's school meals, who's hired street kids and turned them into world class chefs, who's tried to use social networking to teach entire towns to cook. Now he's trying to create healthy kids' meals at hotels. Lord knows healthy kid meals are tough to come by on the road. Usually all you'll see are staples such as chicken fingers and fries, grilled cheese and fries, hot dogs and fries, macaroni and cheese and maybe a pizza. Well Jamie's now partnered up with Sweden's Scandic Hotels to revamp their nutritional fare and he's starting with the kids. Good on you Jamie. Hopefully it's a trend that other hotels will jump on.